Also, a quick question: When I first joined, the guild motd stated that the person who contributed the most of something (I forget what it was at the time) Would be taken along for some T11-H Content. Any more contests/rewards coming down soon? Blood Legion Spec Ops is an extension of Blood Legion, created to assist BL in its push for higher ranking and provide a structured and enjoyable environment for the Illidan community to be involved with Blood Legion. The guild’s main purpose is to assist in fulfilling BL's consumable needs during progression and also aid in the development and exposure of BL/Illidan recruitment. The heart of Blood Legion Spec Ops is comprised of 10 Blood Legion alts (zero mains) who enjoy raiding 10man content during farm/downtime. This is a project that BL has pursued for several tiers now, but is just now something we decided to make official. Since BL has tight restrictions on who is able to join, we decided to create the Spec Ops guild in order to promote better communication with the Illidan community, as well as to provide our supporters with a means of helping us out directly during progression. Many different sorts of players currently call Spec Ops home. The guild is open to anyone who wants help provide raiding consumables (fish/herbs/gems/etc), players who just want to be a part of the BL community, and/or friends and family of BL members. The guild actively participates in many facets of the game, including 5-man dungeons, Battlegrounds, Arenas, 10-man raids, and levelling. Finally, Blood Legion will also draw from Spec Ops to help fill empty slots in alt raids at our own discretion. If we need a spot filled, we will first look to BLSO rather than trying our luck in Trade as we formerly have done. Please do not ask to join; we will ask you should the need arise. If you find yourself in this position, do your best and try to impress us with your skills and talent! We're always looking for exceptional players to add to our main roster. Thank you for your interest in Blood Legion Spec Ops! As far as how things work with promotions. They are given out 1 of 2 ways. 1. Donating certain things the guild needs (always listed in the Guild Message of the Day). This varies and is not always an ongoing thing. It can vary from herbs, fish, gems, and volatiles to things like adding new recruits to the guild or anything else that may assist BL in our efforts to attain higher ranking. These requests are not an ongoing thing so make sure you take advantage of these opportunities when they arise! BL returns the favor by not only offering promotions within the guild for helping out, but also from time to time we give out raiding titles and gear (ie Sinestra Dragonslayer titles!). 2. 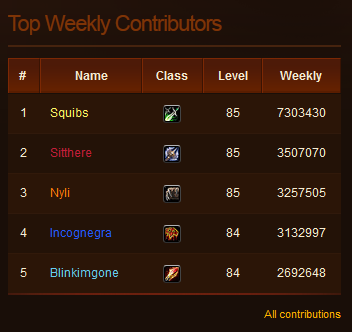 Having the highest guild activity on a week by week basis (Resets every Monday night). Thanks for the quick reply Riggnaros! This week I am going to try to be in at least the top three for guild experience, as well as helping to supply some more of the things currently needed for BL progression. Let's see if I can get a few of the listed items knocked off the MOTD! We don't. I blame Turbin. I'm going to laugh when BLSO gets that achieve before BL. Shinafae wrote: We don't. I blame Turbin. I'm going to laugh when BLSO gets that achieve before BL. That sounds like a challenge! But alas, that thought of that much finish is soul crushing. Made the top three this week, but I definitely had to work for it! Plan to contribute as much as possible in the coming weeks for Dragon Soul progression. Best of luck to everyone, we're rooting for you! If there's ever anything I can do to help, just say so! Turbin might be in some trouble... this sounds serious. Due to recent hardware problems, I won't be returning to WoW until a new computer is purchased.